Smartphones and tablets pack an incredible amount of computing power into a compact package, making them great portable calculating and mathematical tools. The right apps can take the headache out of dealing with mundane or complex calculations, or even make learning math — gasp — fun. Today we have one of the best and most entertaining apps on the Android, called Kokotoa. The developers, BlackStar Android, made it user friendly, compatible with all devices and suitable for both children and adults. The Kokotoa app is very easy to handle, so you’ll manage quickly after you download it. Not only that you will improve your math skills, but you will have fun all the way through. 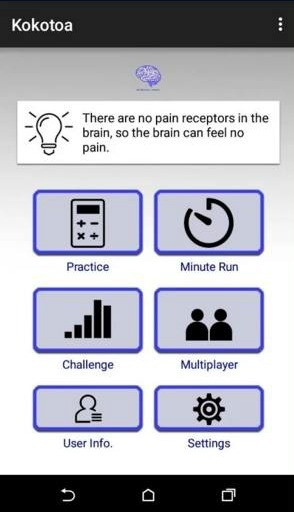 There are dozens of unique features, such as a minute run where you have only one minute to solve as many equations as you can, a multiplayer mode so you can compete against your friends or other users, many challenges where your main goal is to win as many levels as you can, etc. You will deal with multiple math operations, like addition, subtraction, multiplication, division, powers and percentages, but don’t worry – everything can be customized according to your needs (you can choose the type of equations you’re familiar with and the difficulty you’re comfortable with). Challenge your brain with this interesting app - download it today for free from Google Play!